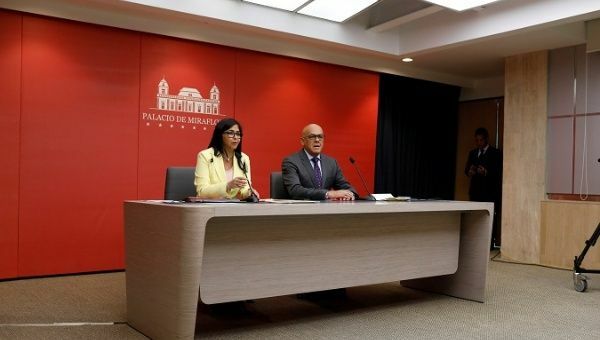 Sept 3 (teleSUR) The Vice President of Venezuela Delcy Rodriguez and the Minister of Communications and Information Jorge Rodriguez addressed the country Monday to denounce the coalition made by foreign countries and media about the “false humanitarian crisis” in the nation, that has been used to deepen the attacks against the government of Nicolas Maduro. In this regard, the Minister of Communications Jorge Rodríguez said that in the last 30 days, 140,599 posts on Twitter were related to “Venezuela” and “humanitarian crisis”, while only 29,989 tweets, related to terms like “Syria” and “crisis humanitarian,” considering that, unlike Venezuela, the Arab country is in a deep war and a brutal destruction. “The Venezuelan policies are of integration to the migratory flow and, mainly, for the displaced as a result of internal conflicts in Colombia,” she said, remembering that currently, 5 million 600 thousand Colombians live in Venezuela. “From 2014 to 2017, the production of cocaine increased, making Colombia the first producer of this drug in the world, according to UN figures and recognized by the Colombian government. (…) The Plan Colombia increased cocaine production and violence,” said the Venezuelan vice president. The former foreign minister also said that the United States already has 46 million dollars contributed to the region to cover the expenses of the other countries in response to the “supposed humanitarian crisis”, charging Washington as the main country responsible for the media war against Venezuela.